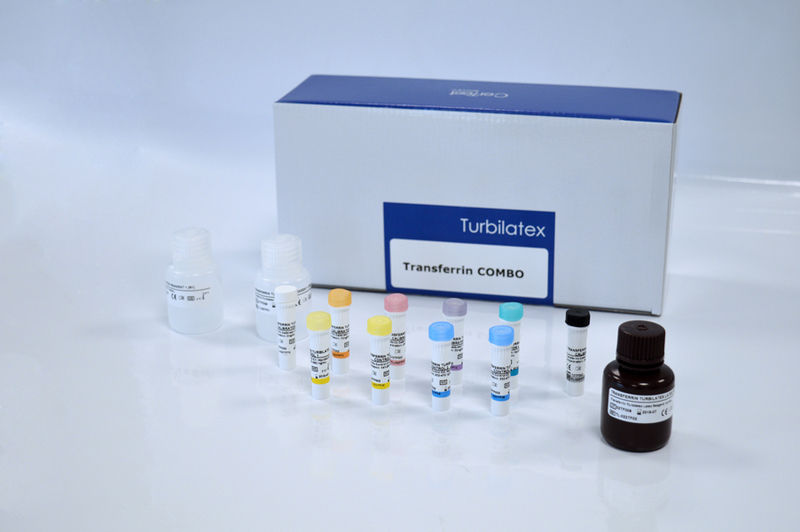 CerTest Transferrin Turbilatex is a latex turbidimetric assay for the quantitative detection of transferrin in human stool samples. This assay is simple, widely applicable and test results are obtained in a very short time. The intended use for this assay is the detection of specific transferrin antigen at very low concentrations. Colorectal cancer is the second most significant cause of illness and death in the Western world. Blood in stool is an important symptom of colon neoplasm, the cancer in its initial stage and intestinal adenomatous polyps. Transferrin is an iron binding protein derived from blood and akin to haemoglobin, which can be released into the gastrointestinal tract and eliminated through faeces in illnesses associated with gastrointestinal bleeding. Transferrin is very stable in stool, making transferrin an ideal marker for detecting the loss of blood from both the upper and lower intestine (gastrointestinal bleeding). Haemoglobin is unstable in stool samples and it is only used to detect lower intestine bleeding. The detection of transferrin in stool provides an alternative method for the diagnosis of illnesses associated with bleeding from the digestive tract.